Low Intensity Laser Therapy (LILT) in the treatment of smoking cessation focuses on addressing the addictive aspect of cigarette smoking by stimulating the addiction center of the brain. This is accomplished by activating traditional acupuncture points thereby alleviating nicotine cravings and withdrawal symptoms. Focusing the laser on these acupuncture points stimulates the body to release endorphins which have a relaxing effect on the body, helping to reduce cravings and lessen physical withdrawal symptoms. Where Do You Place the Laser and Will It Hurt? The laser is placed on certain acupuncture points located below the knee, on the wrist, top of the head and on the ear. Low Intensity Laser Therapy is completely painless and non invasive, some patients report feeling a warm, pulsing or tingling sensation. Before you begin your laser treatments you will have an initial consultation with one of our doctors to discuss your smoking history and how to prepare yourself for quitting. Your personal consultation allows us to understand your unique situation. This entails a general health and lifestyle review including your smoking history and prior attempts to quit. If you have attempted to or had successfully quit in the past we will review the challenges you faced and why you relapsed. Working with you, we will develop strategies to overcome specific challenges you may face on your path to a smoke free life. Your first session of LaserMedix treatments will start 2 weeks following this consultation, after utilizing specific tools provided to break your individual habits. Once the habits are broken, the LaserMedix treatments will work on the addiction. We recommend three visits over a span of one week. The benefits of the LaserMedix treatments are profound and immediate. 90% of all clients experience no cravings following their first session. We recommend that all three LaserMedix sessions be completed to ensure maximum benefits. Your laser treatments will generally last about 30 minutes for each session. There are two parts to an addiction, the physical addiction and the mental addiction. Laser Treatments are designed to alleviate the physical symptoms but not the mental. Although results cannot be guaranteed, currently 98% of our patients experience 100% results. Laser Therapy can be used in conjunction with most types of medical conditions. However, laser therapy is not recommended for individuals with cancer, those taking steroids or individuals with a pace maker. The practitioner will review your medical history during your initial consult and will determine whether or not you are a candidate for laser therapy. 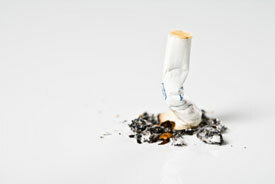 Our smoking cessation program, which includes your initial consultation and three laser treatments is $300 + taxes. After the six month period, should you feel you require a top up of your laser treatment for the smoking cessation treatments, each session costs $60.